Kerala also referred to as Keralam in the native language, is one of the most beautiful destinations in India. It is the southernmost state in India with the Arabian Sea on one side and the majestic Western Ghats on the other. 44 rivers flow through this tiny state with an area of 38,863 km2 and needless to say, lush greenery is the main attraction of Kerala. The best feature of Kerala’s topography is that the tourist destinations within the state are a mix of beaches, hill stations, backwaters, wildlife, historically significant sights etc. Other than the tourist aspects, Kerala is considered to be India’s most advanced state with a 100% literacy rate, high life expectancy rates, low infant mortality rates, preferable female to male ratios, etc. The society is economically well developed and at an average has a superior quality of life. 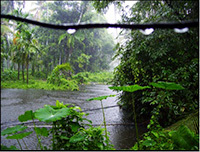 Kerala is blessed with an equitable and mild climate throughout the year. It has a very long monsoon season and it starts from June and continues till November. However, sudden rains can be expected at all times and in every season. Winter is not very strong in Kerala due to its topography and closeness to sea and there will only be a slight drop in temperature which is usually more in the month of December. Summer starts around February and will continue till May. Tourists must know that Kerala has very humid weather and during April and May the heat might be unbearable for some people. However, on a whole the weather is usually the same and travelling will not be hindered by the climate of Kerala. The best time to visit Kerala would depend on what sort of weather conditions the tourist would like to experience. Since the climate is equitable at all times, there is not “bad time” to visit Kerala. So, if you are interested in experiencing monsoon, Kerala is a must visit during June- November. The land is green and beautiful. Of course, no one can deny the joy of dancing around in the rejuvenating rain. But, if you are more interested in visiting the tourist attractions or beaches, then it is better if you plan your trip in any other time except the monsoons. 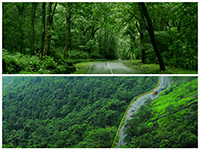 All the hill stations will be lush green throughout the year so one needn’t worry about that. If it is a beach trip that you are planning, try not going during the monsoons as the tides can be dangerous. The best time to visit Kerala would be from September to May. Rice is the staple food in Kerala. Most of the curries you get in Kerala taste best when had with rice. Food items are mostly made of coconut oil or will contain coconut in them in some form. All standard restaurants offer a variety of cuisines including Continental, Chinese, Indian and the local Kerala food. However, if you are in Kerala you must always try to order Kerala cuisine. The food of Kerala is quite different from other parts of India and hence tourists must not miss the chance. Keep in mind that Kerala majorly is a non-vegetarian community and hence most of the “specials” will be poultry, red meat or sea-food based. However, the most famous meal of Kerala, sadya is entirely vegetarian and every tourist must try this at least once during their trip. The sadya is a full meal, usually lunch, with 9 various dishes, rice, chips, pickles and desserts or “kheer” which are called Payasam in Malayalam. It is served on banana leaves. If you are a non-vegetarian foodie, make sure you try the dishes made of prawns, Kappa (tapioca), traditional Meen (Fish) Curry, Biryani, Meat Stew and Appam, Karimeen (Pearl Spot) Pollichathu etc. All these dishes taste best when made by locals. So try to find local restaurants to eat at. However, make sure the restraint is safe and the food you get is unhygienic. Additionally, try to get your hands on some authentic Kallu (Toddy) fresh from the trees. They are sweet and taste best with the heavy and spicy meals you’ll eat in Kerala. Tourists can also buy banana or jackfruit chips available at most of the local shops and bakeries, to crunch on. 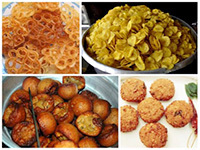 Kerala also has many snack items like Unniyappam, Neyyappam, Parippuvada, Pazhampori, Achappam etc. Try them all during your stay at Kerala. Music in Kerala also has a rich past. Apart from the poetic aspects of it, vocal music in Kerala is Carnatic. Percussion instruments are widely practised and used in Kerala especially during festivals. Chenda, Madhalam, Edakka etc are some of the musical instruments from Kerala. Tourists are always welcome to experience this rich tradition in Kerala. The Kerala Kalmandalam is known for imparting training for most of these art forms. It is situated in Cheruthuruthi in Trissur District. The simplicity of life at the institution is the prime example of living and culture in Kerala. The Kalamandalam is open to tourists and daily tours from 9:30 to 1:00 are conducted. Tourists can pre-book their tours and visit the institution to experience Kerala’s culture at its best. The movie industry in Kerala is also worth mentioning as they also have played a very integral part in the culture of the land. If time permits tourist must watch at least one Malayalam movie during their stay in Kerala. The movies are realistic and down to earth unlike most of the Bollywood movies.